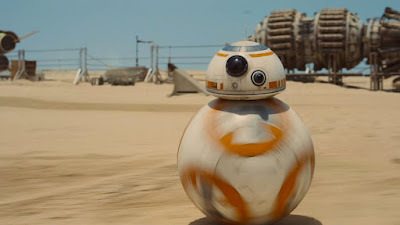 One sequence that never fails to get a reaction out of the audience in Star Wars: The Force Awakens is the moment when BB-8 decides to help Finn out and tell Rey the location of the Resistance base. After Finn shoots BB-8 a thumbs up as thanks, BB-8 returns the gesture using a lighter to simulate a thumb. Turns out, this sequence was never in the script and had to be figured out after the scene was shot. “It was probably something that J.J. either came up with on the day, or certainly came up with later,” Neal Scanlan, the head of The Force Awakens creature shop, told MTV News. I think it's safe to say they succeeded in creating a memorable, if not iconic, moment for the new film. I thought he was giving him the finger for making him lie. This is a good example of coming up with an idea during production and adding it in post. A bad example is randomly making Zam Wesell a shapeshifter and doing nothing with that concept other than wasting time and money on two pointless effect shots.